The house move is finally upon us, we're due to move on the 12th of April and going to be spending 5 days in a field between now and then. So what with packing, Kim's week of nights and camping there really isn't a lot of time to get everything done so I will be putting this blog on Hiatus until I'm set up again in the new house. Obviously this will be as soon as possible, and I haven't decided yet if I can double time to make up for gap or if I'll extend the timescale appropriately (depends if I find a good streak of items to make). 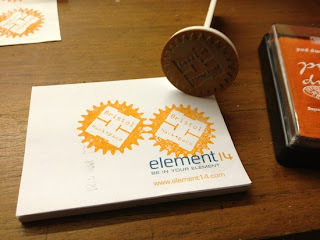 Last night while at Nottingham Hackspace I helped Dominic create a stamp for Bristol Hackspace. After the initial test I did some useful things making the text larger (outset) and creating the handle to mount the stamp on which I think is enough to post it up on here. A few things came together at the right time for this one. I liked the sprues from yesterday so thought I should do something else with them. The Mk2 iron man arc reactors have 10 sections of plastic located in a ring around the outside of the arc. currently these were placed into the mold separately, but that was a bit of a faff. I figured they should each be on a sprue and connected to the centre of the arc. The whole item can be lifted out of the laser as one piece and placed into the mold, and I'll cut the sprues off afterwards. So I devised this test pattern to work out how big the sprues should be. 0.25mm sprue is completely gone, which ties in with my 0.2mm laser kerf. 0.75mm works well on all the different materials and is still quite sturdy so I'll be using that size. The second design on the drawing board was the parabolic reflector. All the light for this cone is reflected to the point right in the middle and in line with the top of the cone so it should be easy enough to find the hot spot. The calculator for this can be found here. I started to scale this one up to 1m in height to create a very large reflector until I was reminded that I'm going away next weekend and I haven't sorted out my costume (non laser cut) for that yet so I had to switch projects mid day. I will be returning to this subject though. Also this is item 160 in 160 days, I should enjoy it while it lasts though because I'm away for 5 days at Easter and we're due to move house any day now. The UK has been bathed in sunshine for the last 2 days so I've taken a a bit of interest in reflectors of one kind or another in an effort to create fire (and ultimately as a way to potentially warm up our new bathroom with a solar heater). I started with this Fresnel reflector, the idea of a flat item is quite appealing. A calculator to work out the angles and sizes is available from here. After I assembled the prototype though it really doesn't look like a lot of reflective surfaces so I decided to move on to the next design.